The GEN project (Global Engineering Networking) is an effort at creating a network where engineers can get the information they need and where suppliers can provide the information needed by engineers. This section will describe GEN, show the architecture of GEN and the usage. At the end, the specific influence GEN has on ceXML is mentioned. In engineering enterprises, close co-operation with other firms is needed. One firm cannot hold all knowledge, technologies, resources, products, etc. GEN's purpose is to create a virtual enterprise, tying multiple suppliers, vendors, resellers, etcetera together into one big virtual enterprise. Currently, easy exchange of the needed information is hard to achieve. Different sources (catalogues, CD's, Internet) have to be searched to get to the needed information. Various sources of information should be accessible in an uniform way. Standardised classifications should be used to access the information. Extension of classifications should be possible to allow for customisation to a company's needs. Information must be accessible, not only in the 'correct' classified place, but also when it has a strong relationship with information elsewhere in a classification tree. Reuse of existing data, whatever the source. Companies should be able to maintain their data on their own, due to political, security and consistency reasons. Normal systems for electronic commerce are working with a purpose-build local system. GEN uses existing classifications to store information and allows the distribution of the information amongst a number of sites. Figure 5-1 depicts the usage of GEN as a method of co-operation on which solutions can be build and to which existing systems can connect.The channel of communication is the Internet. Each company's internal system is connected to that channel of communication by means of a so-called GEN co-operation layer. This co-operation layer uses it's own meta data (basically: it uses it's own vocabulary) to communicate with the other GEN sites. Company-specific, as an added service for their website. For an entire domain, all along the entire supply chain. The architecture of GENial uses an two-step method to get useful data from the suppliers to the users. GEN uses XML as an intermediate exchange format. Data is first extracted from the suppliers data source (whatever that may be) and converted to the GENial XML format. Next, the data is ready for integration into the GENial infrastructure (whatever the implementation). The same route can be followed on the way back to the end user (Figure 5-2). 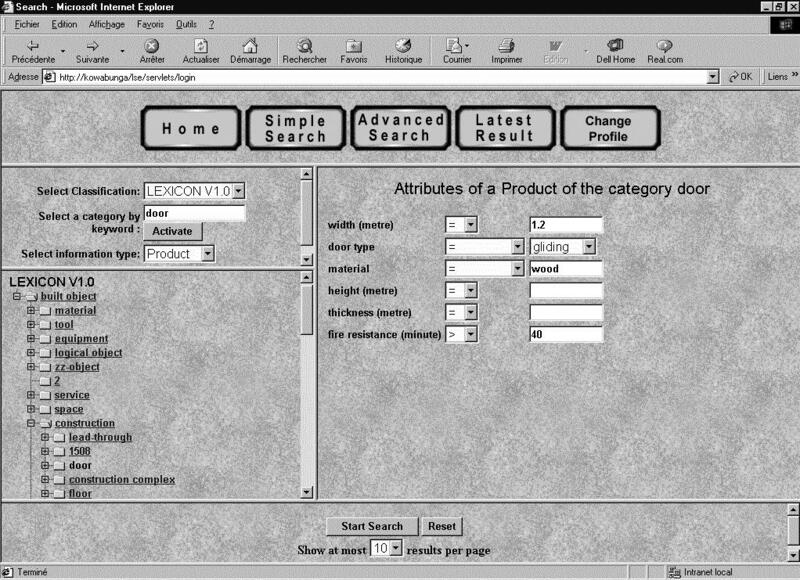 The interface presented to the user in GENial (Figure 5-3) depicts the way GENial is to be used. As said, GENial is a reference implementation of a GEN infrastructure. In the upper left part, the user selects a classification system of his choice. A tree-like representation of that classification is available in the lower left part. Once the user has made his choice (in this case, the element door in the lexicon classification), the choice appears in the right part of the screen with a list of all attributes and a means to specify restrictions for those attributes. So, width can be set to be 1.2 m and door type to sliding. Next, the search button can be pressed and all doors meeting those criteria that are available in the GENial system are listed. The use of XML is arguably effective as an intermediate format between the original data and the infrastructure of the actual content management and the content providing layer. The need to make this intermediate format easily usable must also be met by ceXML. The question remains whether one xml format will be sufficient for both the exchange with the original data and for the actual sending of information. Are there different needs for both cases and, thus, should the format be different? Another influence is the way user interaction is done. Using a classification and known attributes to select the needed information seems like the most straightforward and simple way of handling the interaction with the user.